Back to the Future theme park land. Let's go Back to the Future again with its own theme park land. As we reach and past the incredible future of October 21, 2015. The year Back to the Future: Part II will be part of history. So, what could have been the most awesome land for Universal parks pop-up. 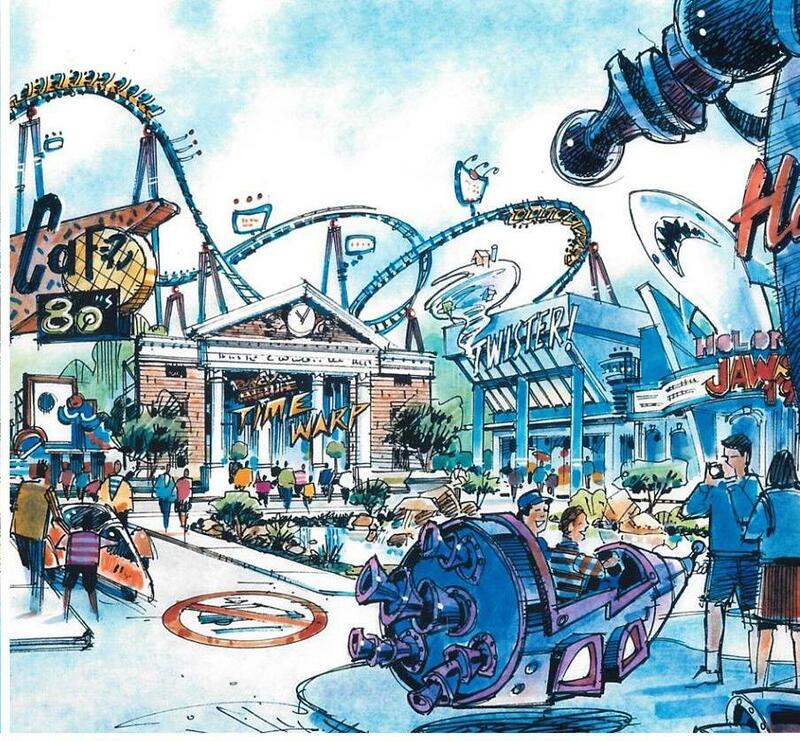 Concept art from the Goddard Group had one nice sketch of an area base around Back to the Future 2015 theme. The theme park land was plan for the UK/Europe markets when Universal Studios was trying to expand its theme park brand around the globe. Imagine if this could have been built for either Orlando or Hollywood. Even having this theme for Universal City Walks would be perfect for their shops and restaurants. A retro future that as Universal would say, put you "In the Movies". I love to have Back to the Future back at the theme parks, So until either a reboot, sequel, or dump truck full of money drives up the powers that be. This would have been great to see. I ready to go BACK! Last edited by Stingray; 10-20-2015, 06:42 PM. This would be a cool concept at Uni Orlando. Especially how popular and loved these movies still are. That rocket in the foreground looks awfully familiar. D'oh! I just notices the red "H" on the far right. Obviously, part of the plan was to duplicate the "Hanna-Barbera" ride in this proposed area. I think a BTTF land would have been a lot of fun, but I wonder if it would have been successful. There where a lot of cool things going on worldwide on 10/21, but that's the one and only time I've seen anything for BTTF since the movies came out. I think it might have been popular for a couple of years but then people would lose interest. I do think that a Cafe 80's could totally work, but in Citywalk rather than in the parks. Maybe this is the reason why when "The Simpsons" opened they made an entire area for it. Can't let a good idea go to waste.